Aside from the disjointed rhythym of multiple drum troupes echoeing off and around the huge Karst outcrops that welcome visitors to Batu Caves, one of the first things I note after disembarking from the unusually busy KTM commmuter train is a brilliant disc of silver light slung low in the milky dark suburban skyline. The moon is in full phase tonight and this is why I, along with many thousands of others who have been gathering throughout the night, have assembled at this most auspicious location for Malaysian Hindus. The arrival of the full moon during the Tamil Indian month of Thai is the signal for over a million devotees to visit the sacred cave temples at Batu on the City’s northern fringes to bring offerings to Lord Murugan, the spear-wielding Hindu god of war and victory. For those of a more extreme disposition, the celebration also presents an opportunity to pay penance for their moral weakness through pulling chariots or other sizeable objects using only hooks attatched to their bodies, or piercing their tongues and faces with a variety of spear-like implements known as “vel”. 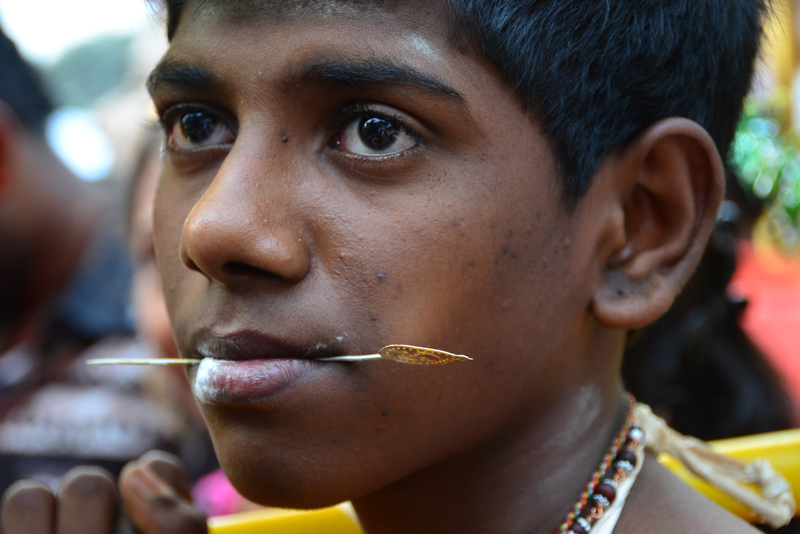 Welcome to the eye-opening spectacle that is Thaipusam. Brought to Malaya as plantation labour during the days when Brittania not only ruled the waves, but a significant part of the land mass of the entire globe, the local population is comprised of a significant Tamil Indian minority who these days number comfortably over two million people. By the end of today’s proceedings, countless members of this community will have visited the Temple Cave, a normally quiet complex inside the huge cavernous opening. As the sun climbs steadily into the tropical sky, many worshippers, clad in brilliant yellow, can be seen carrying pots of milk on their freshly-shaven heads. Others, who have walked bare-footed through the night from the Sri Maha Mariamman temple in central Kuala Lumpur, will have carried a burden in the form of a huge and ornately decorated frame known as “Kavadi” or will arrive lanced and pierced by dozens of hooks. 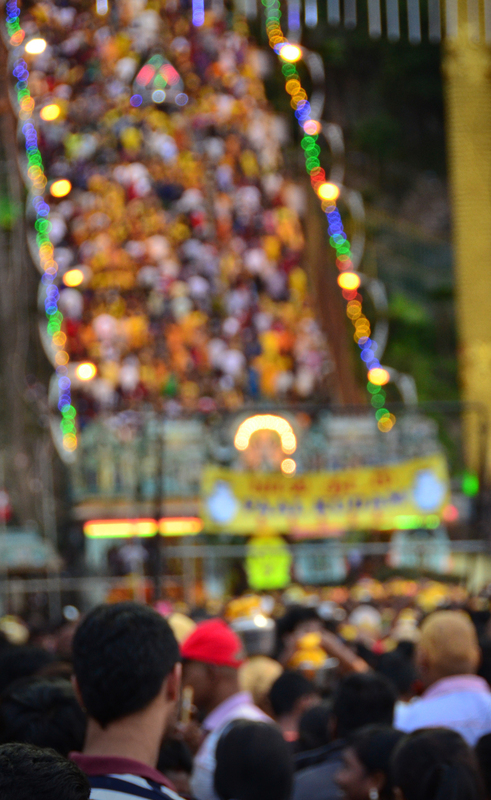 Passing the 43-metre high gold-painted statue of Murugan who guards the entrance to the caves, a sething mass of devotees will then have to climb 272 arduous steps to reach their final goal and deliver their offerings to their God. The bearers of kavadi will have spent the past month spiritually preparing themselves for this day. A strict vegetarian diet will have been adhered to for a month, as would a vow of celibacy. In the days immediately prior to the festival, the worshippers will also have been fasting. 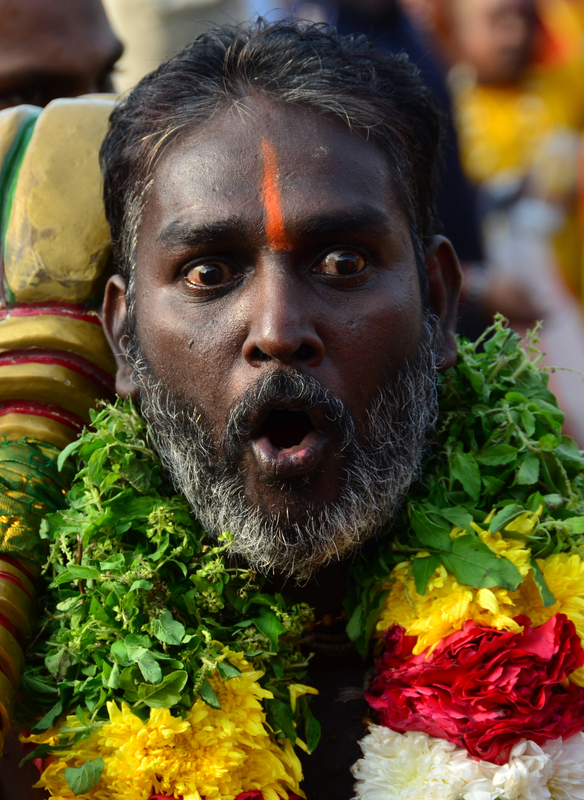 This limited diet, combined with the physical demands of bearing Kavadi on a long sole-less hike through the suburbs, the endless hypnotic rhythyms of the accompanying percussion bands, and the consuming religious ceremonies they will have undergone over the past few hours result in some followers being in a state of rabid-like trance when they arrive at the foot of the caves. Flailing limbs, piercing screaches, wailing, chanting, dribling of saliva and the lolling of stained tongues. None of this seems particularly out of place after a short while in the company of Murugan devotees. 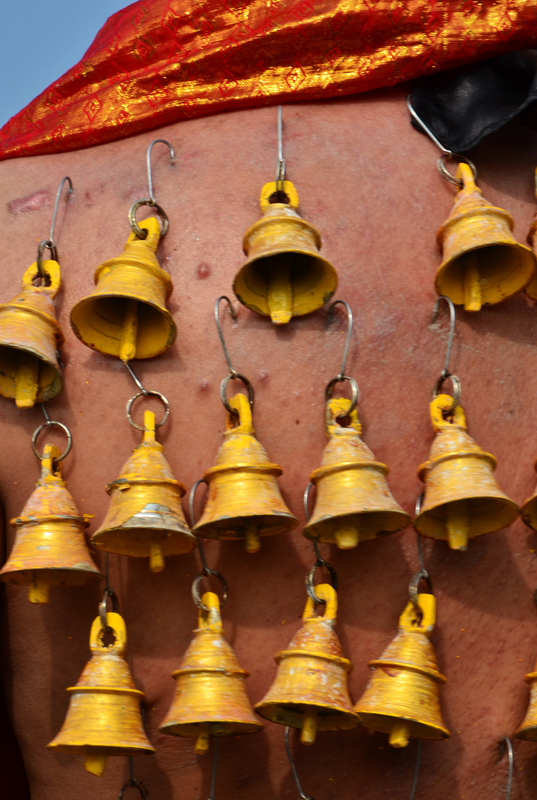 The “vel” bearers will have ceremonially lanced their tongues, lips and cheeks to prevent them from speech, whilst numerous others will have a variety of fruits, bells and miniature milk pots dangling from their pierced hides. Those who carry significant Kavadi appear to have a well-drilled support team in tow (sometimes literally “in tow” as they are restrained in their mania by chains and harness ropes), who provide the bearer with water, food or a plastic stool for resting. Some of the devotees both look and dance as though possessed, others seem serene and other worldly offering blessings to those who approach and request as much. I note that the trance-like state varies between groups as if it is to an extent a learned behaviour influenced from those nearest to them and reinforced by an accepted group conduct. Tongue-lollers are often accompanied by other tongue-lollers from their Temple whilst other Temple groups display none of this trait. There is an element of mass hysteria taking place here today, of that I have little doubt. The heavily littered banks of the Sungai Batu River are the backdrop for some of the most surreal activity I witness. Rows of makeshift tarpauline barbershops serve to clean worshippers of head hair whilst open air showers allow the faithful to cleanse themselves before the final walk to the caves. Nestled beneath what is normally a busy highway but today a procession route, one showering area is surrounding by temporary shrines where holy men give blessings, flames are lit and bodies are pierced and decorated. The combination of tired minds and unpredictable mania leaves me ill at ease in the unmanouvrable company of one group of devotees when a substantial amount of burning material comes worryingly close to my face whilst being held aloft by a dancing, bug-eyed, and drooling worshipper. A priest lays hands on the head of people, one of whom collapses into a fit-like state right in front of me. A woman has her brow pierced seemingly without any antispeptic nor painkiller and a man erupts into a series of animalistic grunts and screams whislt lashing out wildly with his arms and legs. All of this is accompanied by the endless drum patterns and chanting of “vel vel shakti vel” as the group work themselves into hysterics. I have been fortunate to see many interesting things in my life and visit some of the worlds greatest festivals, but today, a mere 20 or so kilometres from where I live, was by far and away the strangest morning of my entire life. I searched, I failed. And then I accidentally found one in Ubud. 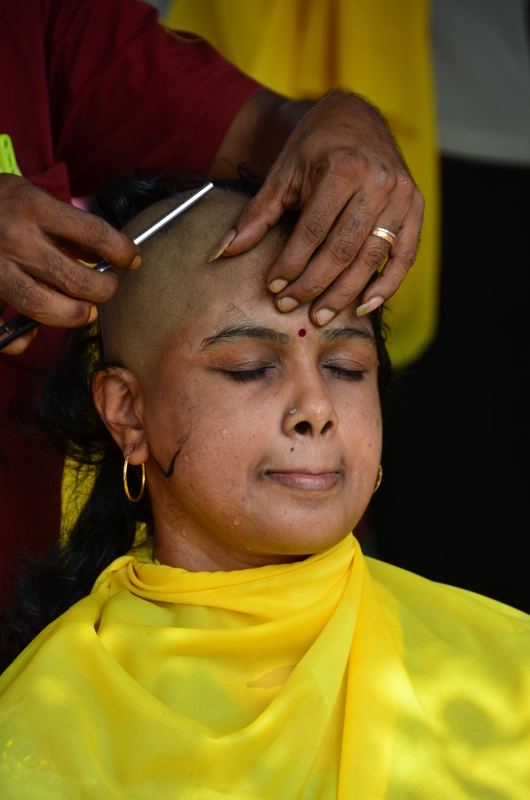 This entry was posted in Uncategorized and tagged Batu Caves, body piercing, Hindu, Kuala Lumpur, Murugan, Thaipusam. Bookmark the permalink.